You Like Maps? You Like Weather Forecasts? You'll LOVE Weatherbonk ~ Android Forever! Weatherbonk has put it all together for you. 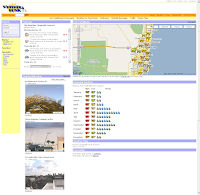 It combines your local weather forecast, a Google map with current temps, monthly averages of temperature and precipitiation, and several live weather cams. That makes for a pretty handy web site. It also has a Power Map that you can click on and get the forecast for that specific location, in addition to some other neat-looking stuff that I haven't had time to play with yet. You can get there by clicking here.